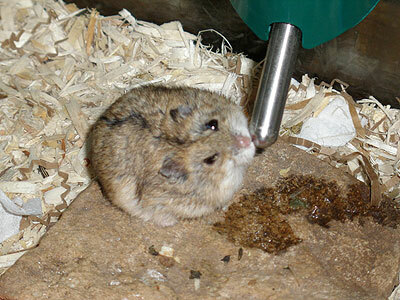 Roborovski Dwarf Hamsters are typically 3 to 4 inches (7.6-10 cm) in length. They are born with one of four coat types: normal, satin, wavy and rex. The normal coat is short and flat. The satin coat is shiny and gives the appearance of being wet or greasy and the gene enhances the fur's color and gives it lift. The wavy coat is slightly long and wavy; the whiskers are curly when young and, although the coat moults out to a normal coat, the curly whiskers remain through adulthood. The rex coat is a soft, short coat which is curled so as to be "lifted" from the body and the whiskers are curly. The rex coat is often sparse and remains curled even in adult hamsters. Roborovski Dwarf Hamsters are available in six basic colors plus many variations thereof. All are marked by a dark stripe down their back, the color of which varies depending on the shade of their fur. Not all white hamsters with red/pink eyes are albino. Some are so heavily mottled or tinged with platinum that they will appear to be white. Hamsters carrying the black gene (almost half of all variations) are prone to "silvering"; in extreme cases the eventual result is an almost white hamster. When two ruby-eyed mottled hamsters are bred, approximately 25% of the litter are born lacking teeth and eyes; these pups, called "eyeless toothless," generally do not live past weaning. Whether a mottled hamster has ruby eyes (which often appear black) can be difficult to determine; pointing a flashlight at the hamster in the dark may reveal the hint of ruby. Furthermore, some mottling may be too small to be noticed, or the mottling may be misidentified as platinum markings, and in these cases two ruby-eyed mottleds may accidentally be bred, resulting in the ill-fated pups. Combining the different mutations has produced new colors, including blue, blue fawn, lilac fawn, beige, chocolate, champagne, dove, and others. Contrary to some claims, the different colors and markings of hamsters do not indicate personality differences. Most breeders attempt to predict personality by closely examining the bloodline and any neurological diseases the hamster's ancestors displayed. Roborovski Dwarf Hamsters have a thin, dark gray stripe on the back. One of the easiest features to distinguish a Roborovski Dwarf Hamster from other dwarf hamsters is the color along the side that separates the gray-brown or light gray on the back and the white of the stomach. Roborovski Dwarf Hamsters have a light brown or light gray color between the two colors while other dwarf hamsters, like the Russian Winter White Hamster, will have a dark line. No stripe on back. Distinctive white patch above each eye. Narrow, dark gray stripe on back terminating about 1 inch (2.5 cm) above base of the tail. Thick, black stripe on back all the way to the base of the tail. There is a dark patch on the head. Dark stripe on back. Head has dark patch. Gray-brown to light gray on back. Off-white sides with white belly. Gray back and white belly. Dark line separating gray and white. Gray to gray-brown and light gray belly.